There’s a lot of urban design to comment on in the broader Basin / Memorial Park scheme, which we will get our teeth into if and when some more advanced plans become public. So far though, there is not a lot in the way of architecture, with the exception of the proposed new Stand, by Athfield Architects, and so this is the first topic for discussion. The Stand (inevitably, it will become known as the Morrison Stand, given his huge role in its birth), has so far been promoted solely by two pictures – a front and a back (shown below), but no plans, (update: plans have been published by NZTA on their website, an excerpt is included below), no details have yet been published, except for a figure of $12 million. Surprisingly, given its prominence, there has been little or no comments on its appearance or siting by anyone yet. So let’s start the cricket balls rolling, shall we? Firstly: why is it there? Is it because of the two major stands already on the perimeter of the Basin Reserve, the older, heritage stand has been condemned as an Earthquake Prone Building, and can’t be used but must be strengthened or demolished, and no one has the money for that? (The younger, newer R A Vance stand is not under such a threat, but is apparently also a bit run down, especially in the player amenities department). Or is it there because the northerly wind whips through the Basin, and a tall wind break was needed, enabling the new stand to cast a lovely cooling shadow over the hallowed turf? Or perhaps it is there out of the kindness of NZTA’s cold asphalt heart, as they love the game of cricket so much that they want to be a part of it, and just felt like funding a free giveaway building for the hell of it, despite vowing in public that they had promised no such thing, and that no such letter of agreement ever existed to promise such a thing? Perhaps I’m being too cynical – is it simply a response to the needed replacement of the present WC facilities at the Basin, which have been described by Councilor (and Mayoral hopeful) John Morrison as resembling Soviet era concrete bunkers, and a vital part of the Basin’s upgrade plan to remain a world class cricket facility? Or is it, perhaps, a means of mitigation to allow the NZTA and Councilor Foster to tick the box on the Council’s spreadsheet where it says “mitigation needed” to hide the ugly flyover from the eyes of the Barmy Army and other shell-suited supporters of the ancient game? It is, of course, an answer to all of those points. The Morrison Stand will contain no seating for the public, as far as we know, but will contain new player facilities, new public toilet facilities, new entrance gate facilities (and so probably a ticketing booth, as well as almost inevitable catering facilities with built-in hot dog dispenser). The player facilities will be at first floor level and link back to the Vance stand, while the public will stay at ground level. The uppermost level is the odd one out – with clearly a place to stand for a select few people, but not enough for any real amount of public seating? I am picking that it is an elite viewing platform, for players and officials, perhaps even media, but not the public. It is just a screen by the look of it, to modulate the skyline, to hide the flyover, and to stop those on the flyover from watching a free game of cricket. Buy your own ticket, you freeloading dirty motorists! There could be a chance, I suppose, of the Cricket Museum being situated in the new stand as well, given that the building that it is in, is condemned, but it does not look as though there is enough room for that to happen. The existing entry gates, apparently a heritage building in themselves, appear to have been demolished have been moved to the south in these renders – no great loss there, as they were never really great works of architecture themselves. Surprisingly, the existing “Players Pavilion” is still intact, even though I would have thought that it’s purpose has become redundant. Perhaps Mystery Morrison can confirm the details. 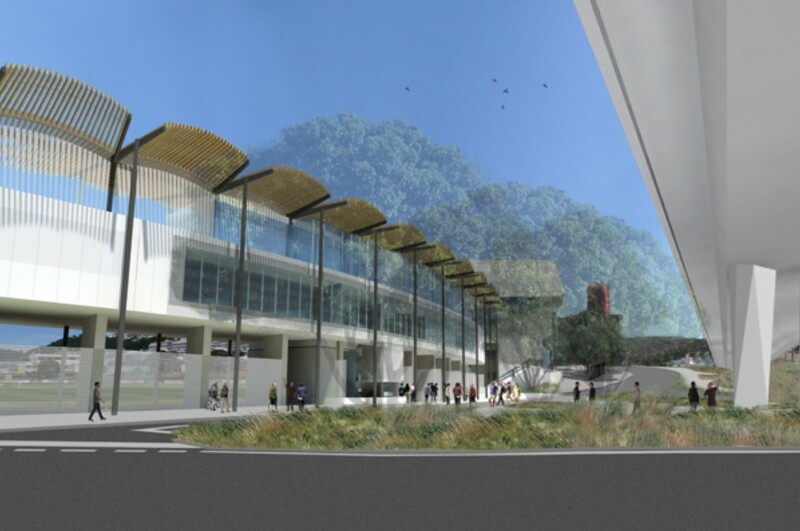 The primary purpose of the stand is, of course, a political sop to the Basin Reserve Trust by the kind people at NZTA. Morrison has them over a barrel on this – which shows astute negotiating tactics on his behalf should he become Mayor in October. Evidently quite early on in the process he promised NZTA that he would make life quite difficult for them unless they bowed to his demands of a new Stand, and he has steadfastly held them to that since then. Some would argue that this is nothing more than political blackmail, others would say that this is just a gentlemanly agreement. We can be assured that if Morrison does succeed in his Mayoral ambitions, and so far he is putting up more of a campaign than Wade-Brown is, that the new stand will be in place long before the flyover is. New and updated : PLANS! But back to the architecture. The building is, as all recent Athfield Architects buildings are, quite tastefully proportioned. That’s probably because it has been designed by one of the brighter young things at Ath’s, rather than the grizzly old master himself. Long gone are the days when an Athfield building came with a zoomorphic flavour, such as the curious hump-backed whale carcass of the Church of Christ Scientist building, or the octopus-flavoured restaurant at the top of the cable-car. Long gone too are the slightly disturbing tricks that Ath would play with our minds, such as the schism in the Palmerston North library, or the stunted ground floor columns of the Wellington library. Instead we have more comfortably proportioned structures such as the Courtenay Place pizza shelter, with which this stand seems to hold a common heritage; or perhaps even the new Clyde Quay apartments on the old OPT wharf (still unseen by the public, so we will hold judgement on that). 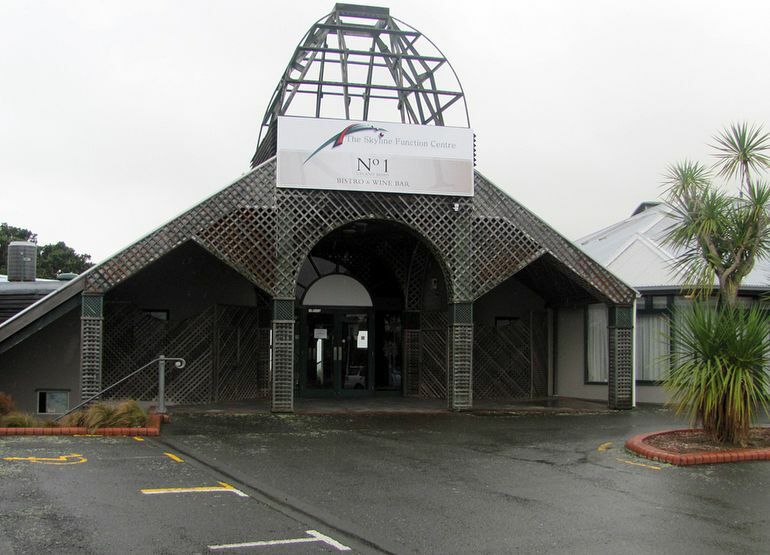 Incidentally, speaking of the old octopus, it seems somewhat incredulous now that the Skyline Restaurant building received a national NZIA award back in the 1980s, when you look at what a decrepit mess that building is in now. Perhaps a national campaign to save it and restore it to its former glory is needed! Or, perhaps not. Let bygones be bygones. I am intrigued by the top floor of the new Stand however, and not just because of its unknown purpose (update: refer to plans). From the rear, the roofline has a feathery, scallop-fringed look, with timbery edging fanning down in a regular module. From the front however, that same feathery module has become upwards facing, and will create a pleasant modular pattern over the lawn of the hallowed ground, with a nicy wavy edge instead of a hard defined line. I’m not sure how edge up becomes edge down, and look forward to seeing it in the flesh, so to speak, should the Stand eventuate. As a piece of architecture then, I genuinely like its appearance, even if as a piece of urban design I find that it has several strong drawbacks. Chief amongst these is of course that it is designed (let’s be honest) for one reason: to block the view. It is there to block the view of the flyover from the ground, and to stop disconcerting movements being apparent to the bowlers and batters when standing at the crease, and extends for 65m long, despite the NZTA’s sketches showing that they needed something only in one small area to block the view. Being three stories tall, and therefore about 9-10m high, it will also provide a baffle to the noise from the flyover, as well as visually spoil the view, if not completely eradicate it. It is therefore, one could argue, a very selfish Stand, one which caters to the Basin Reserve Trustees, and not to the city. The view of the flyover from the flanks of Mt Victoria will not be lessened one iota, a point that is sure to enrage the likes of Elaine Hampton and Save the Basin even further. Personally, I am against the flyover because it is just so technically pointless to have a 250m long concrete bridge when simpler solutions existed at less cost, but as far as flyovers go, it’s much of a muchness. They’re all ugly concrete structures, they all get covered in graffiti, and they all spoil a viewshaft – and this one is no different. In urban design terms however, the viewshaft down Cambridge / Kent Tce towards Adelaide Road will be first framed by the flyover, then infilled by the new Stand. It will significantly alter the way that one half of the city can look at the other half of the city, but I’m not sure that this is the end of the world. The other end of the Kent Tce viewshaft has already been cut off some years ago by the ugly sullen lump of the arse end of New World, and it is not as if you have ever been able to see directly from Adelaide Road down to the sea, at least, not for the last 100 years or so. The new Stand therefore can be argued to be both good, and bad. Good in the way that it improves the lot of the Basin Reserve, and bad in that it does nothing much for the city and answers few of the issues for the mitigation of the flyover. The renders on the NZTA website suggest that the existing entry gates on the north side will be moved to sit next to the entry gates (in the same style) on the south side. Maybe if they could come up with a vehicular version of this, it might turn a few of those frowns, upside down. Still a lump of unwanted concrete though. Thanks JC for that very useful reference – I’ve updated the post with images from that link. Well spotted re the entry gates as well. I find it interesting that the new stand casts no shadow. 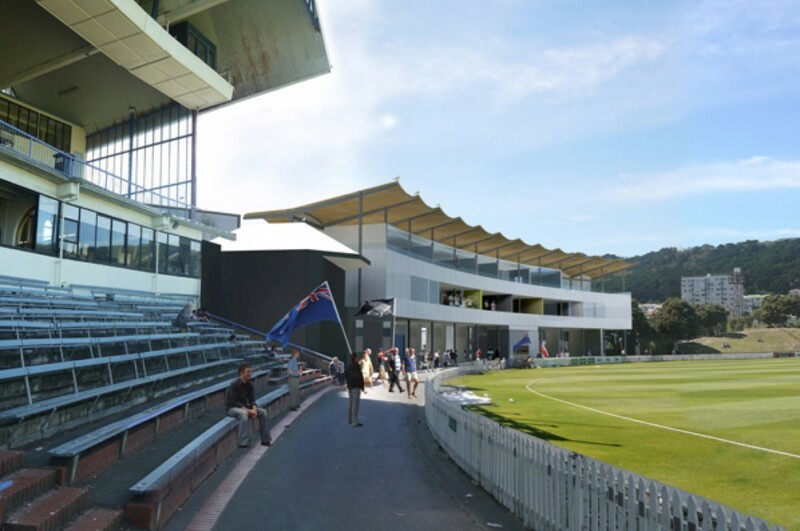 Despite it being at the north side of the Basin Reserve, and despite it being 10-12m high by the look of it, this new proposed stand casts no shadow on the grassy turf of the Basin. But wasn’t one of the arguments against the Option X proposal, as noted by the WCC Urban Design team, that the Option X proposal would cast dark shadows across the pitch? 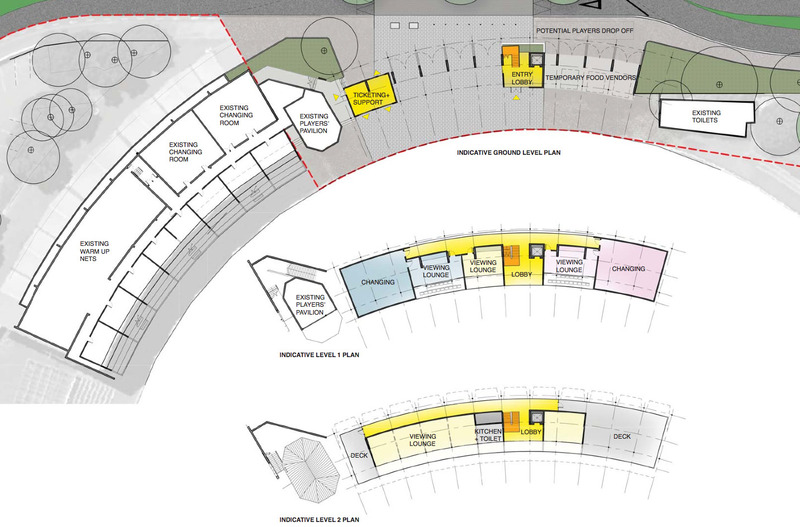 Despite the Option X proposal being further away from the Basin than this new grandstand is? So does that mean that the WCC report was wrong by accident, or was it lying on purpose? Clearly this is the NZTA’s work, but I was surprised at how little of the flyover you could actually see from the south in these pictures – and how little the “viewshaft” along Kent/Cambrige Terraces is affected (there isn’t really a viewshaft there at the moment to affect, unless you stand right outside the north entry gates, but then you will look under the flyover from there anyway…). As usual, the renders from the street are a typical sunny Wellington day with no traffic and plenty of happy people walking about. The built elements have a realistic diaphanaity… yeah right. There is a requirement to show real (not idealised)effects in the RMA I believe. The view from inside the ground, thankfully shows a typical test match (there is a NZ flag so it can’t be anything else) ‘crowd’ on the one day of the year when you play cricket without the wind. Mystery claims this is future proofing the ground… Is it when people still have to cross busy roads to enter the ground and new stands are bunged up with no thought to an overall masterplan of what might happen when cricket eventually becomes a crowd puller (say 50 plus years – and I love cricket). Denny, i admire your optimism that the appeal of cricket will grow, rather than the more likely result of fade away… and for your info, one of the Athfield renders of the outside appears to show someone waving a Tino Rangatiratanga flag, about to walk inside the Reserve perhaps. This of course implies that in the future there may be a NZ Maori side to cricket (as with rugby at present), and so perhaps the great spin-bowlers of the future will be Ngati Maori rather than Ngati Pakeha, or Ngati Pakistani…. Hey, what’s with this Morrison Stand thing? I thought the name had already been sorted by the Save The Basin crowd: The Lipstick On The Pig Memorial Stand. You’re right that Morrison has stuck to his guns on getting the stand, although it’s an open question whether the flyover would have happened at all if he’d stuck to his guns over protecting the whole Basin, rather than just ensuring he had a nice personal viewing platform. I would have thought that a Basin trustee would have been somewhat less of an easy sell on the flyover than Morrison has been, but maybe that’s just my foolish expectation. Although he has demonstrated one key skill – being able to put his hand in other people’s pockets to pay for his pet projects. Perhaps that’s a useful attribute for a mayor, albeit we’d have to get past his penchant for plagiarism, bullying emails to his peers and enthusiastic fronting for dodgy finance companies before we find out. Great post Max. I am a bit surprised at just how little the new stand adds in terms of facilities. Ok, so there’s new changing rooms and some viewing lounges. But the existing changing rooms look larger on the plans than the new ones.. And the Vance stand has a whole level for members to view the game behind a glass wall already. I’m gutted that this is a complete waste of $10 million to hide a another complete waste of $150 mill of a flyover. More gutted that we have to live with them. A coherent plan for the development of the Basin Reserve would involve increasing the comfortable capacity of the ground from the current 8 – 9,000 which is fine for test cricket to the 10 – 12,000 needed to take One Day Internationals away from the concrete jungle of Westpac Stadium – along with the apparently necessary floodlighting for day/night play. How supportive would the more vehement flyover opponents be of this addition to the neighbourhood? I thought the purpose of the Caketin was for cricket, after all its oval shaped so its built for cricket or aussie rules ideally.. The best plan I think for the basin is to make it more accessible to the public, sure close it off for a couple of weeks when a cricket test is held there. But open it up for summer concerts, open up the field so people are free to use it. This is hardly mitigation. It’s a bribe. And it’s making things worse. I agree with those who say its time to tear down the Vance stand, tear down the fence, and start integrating the Basin Reserve into the surrounding neighborhoods. On a tangent I heard back from NZTA regarding the cost of the twin 2.5 km 3-lane tunnels they are building in Auckland. Apparently, excluding the approach works, the mining work, lining, complete fit out, electrical etc of the tunnel parts is approx 500 million. Pretty cheap.